The implementation of water protection measures is necessary to limit damage to surface water and groundwater, as well as to public infrastructures (collectors, pumping stations, wastewater treatment plants). According to the SIA 431 standard and the cantonal directive DCPE 872, the principles of water treatment and disposal, including the securing of polluting liquids, apply to all construction and civil engineering work sites. They must be integrated into every project, from conception to completion. 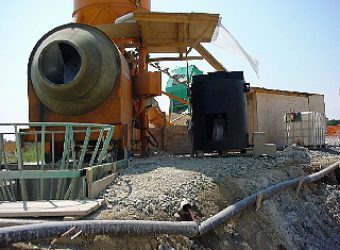 During the demolition, earthwork, special work and construction phases, facility wash water and rainwater from the work site are generally charged with suspended solids. 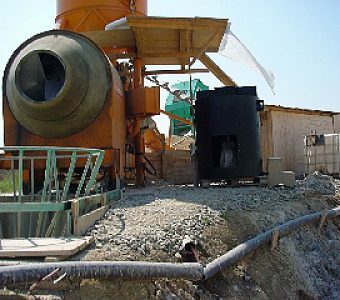 Those in contact with cement, mortar and fresh or crushed concrete become alkaline (pH greater than 9). They also contain dissolved substances (additives) and toxic metals in varying concentrations. Prior to any discharge, these polluted waters must be treated by decantation, separation of hydrocarbons and neutralization (ideal pH = 7.5). The leaching water collected during bad weather must be removed, after treatment, in a clean water collector so as not to unnecessarily overload the wastewater treatment plants (WWTP). It is imperative that the project manager and his works management organise and perform the automatic treatment, as well as the discharge of these polluted waters, starting at the very beginning of the project. Depending on the quality of the water to be discharged, the available infrastructures and the sensitivity of the natural receiving medium, additional treatment by flocculation/decantation or filtration is essential, in order to comply with the limit values of the Water Protection Ordinance (OEaux). Since 2006, the company, established in the Canton of Vaud, which systematically implements a concept of wastewater management submitted to the Directorate General for the Environment (DGE) and which has demonstrated its expertise in water protection, is entitled to a cantonal discharge authorisation. The list of companies benefiting from this authorization is available on the DGE website. 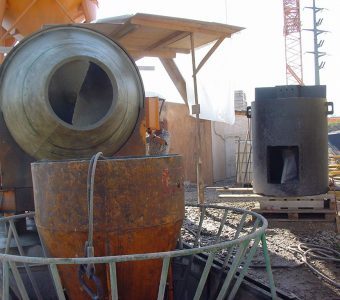 The wastewater produced by the various trades of the secondary work comes mainly from the cleaning of the installations, the containers and the utensils. 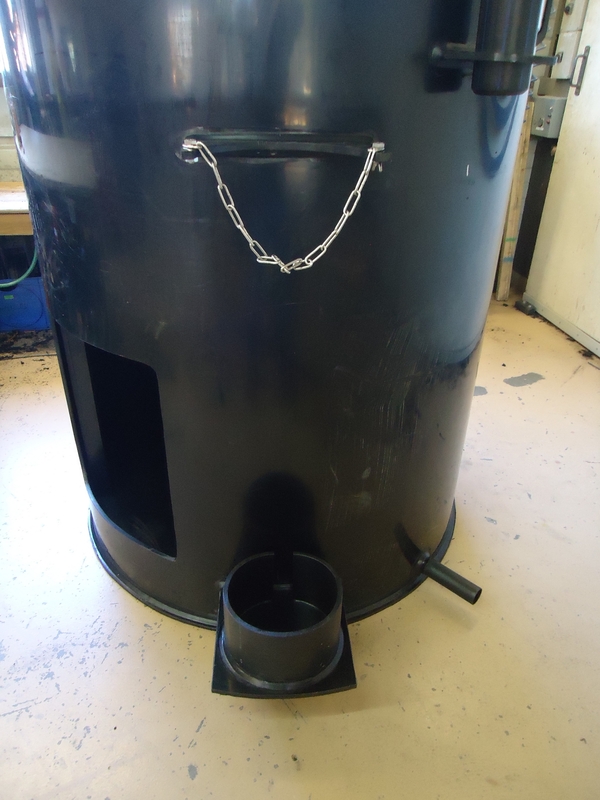 Each solvent-containing product must be fully recovered and disposed of as special waste at an authorised centre. 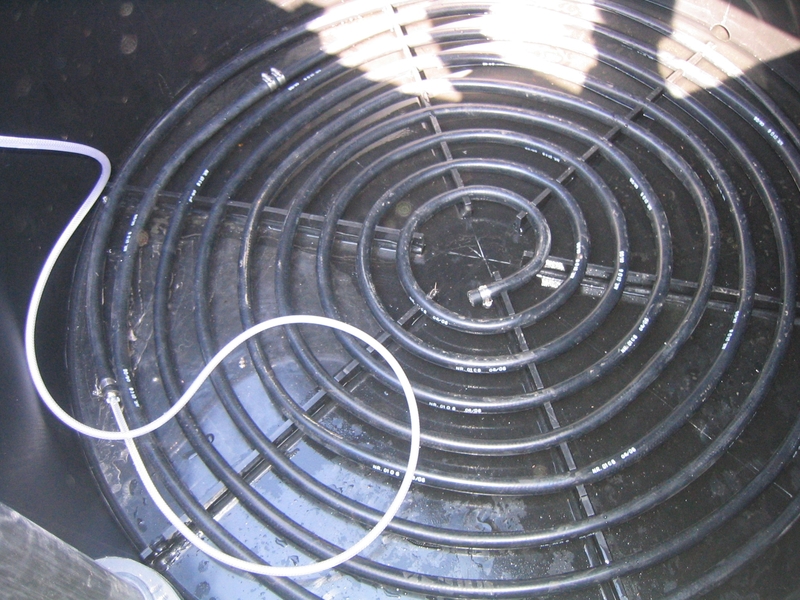 Cleaning water is mainly polluted by dissolved substances (micropollutants, organic materials, etc.) and suspended/dispersed materials. 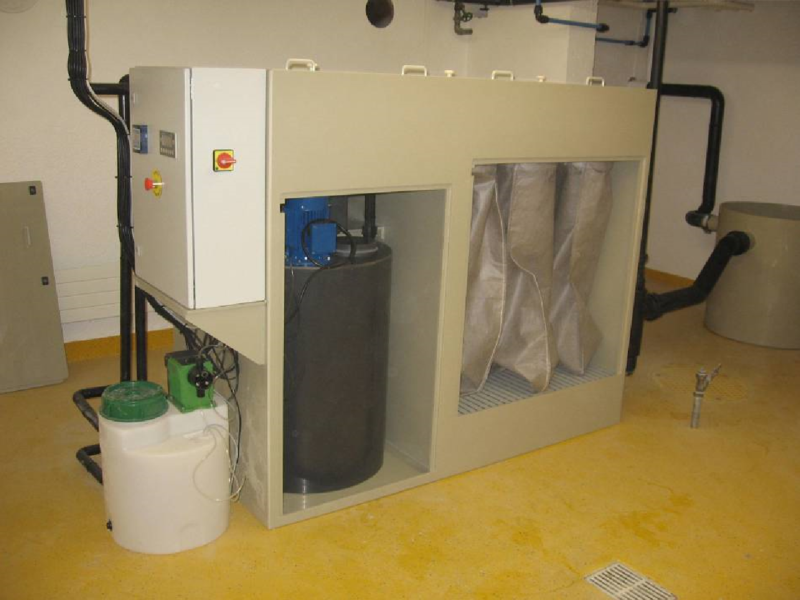 They can be managed centrally (water treatment made available via the works management for all the companies involved in the secondary work) or individually by each company, depending on the degree of ecotoxicity. In this regard, it is imperative to refer to the indications in the product safety data sheet (MSDS) available from the supplier. Polluting liquids (various oils and concrete additives) must be stored in an area protected from the weather, above a watertight container (Ecoplast for example) with a depth of 10 cm (for the storage of containers less than 450 L) or able to collect at least the volume of the largest container (for the storage of frame containers). The "S" zones are plots defined in order to ensure the protection of public interest catchments, which supply the communities with drinking water. Prior authorisation from the DGE is required for any construction project planned in "S" zones. 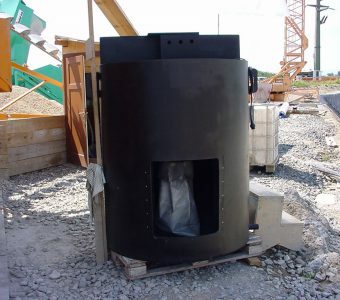 Special measures are applicable to the work carried out there, particularly as regards to the storage of polluting liquids and the evacuation of polluted water. Infiltration of construction water is prohibited. Each secondary work Vaud company which operates a facility for the treatment of its polluted water by flocculation/filtration can obtain a declaration of conformity from the Directorate General of the Environment (DGE) for a duration of five years (renewable). After controlling the company's operating premises and analysing the treated water, the declaration of conformity involves the recovery of the polluted water produced by the company on its work sites to be processed on its premises. 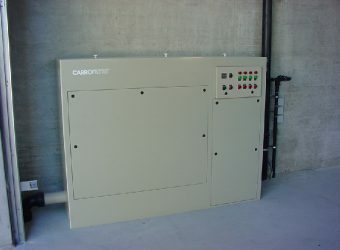 After treatment with flocculation/filtration (on site or in the workshop) water must be discharged into a wastewater collector connected to a treatment plant (Carrofiltre© - Plaster filtre). 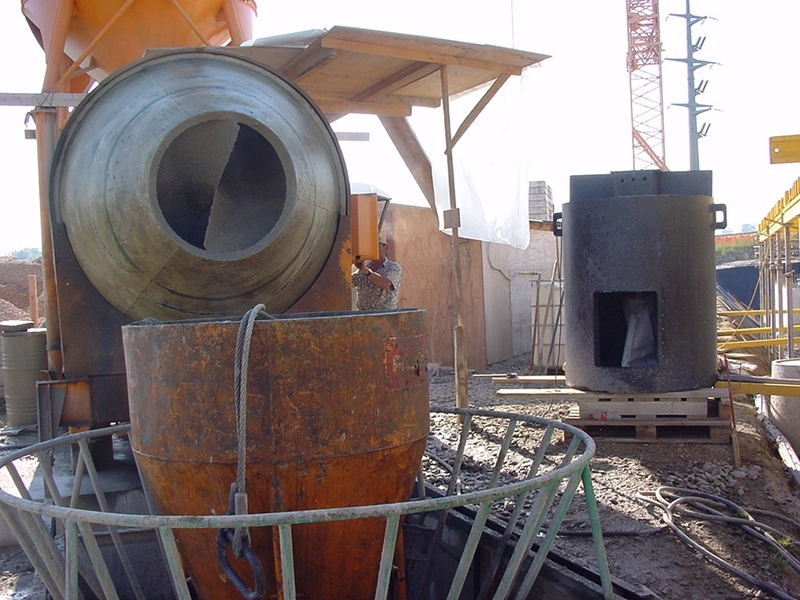 Since 1997, the SIA 431 standard requires the treatment of construction site wastewater. This includes concrete mixer wash water, which, after primary settling, must be treated before it is discharged into wastewater or clean water plastic pipes. To meet these guidelines, Canplast developed Carrofloc©. 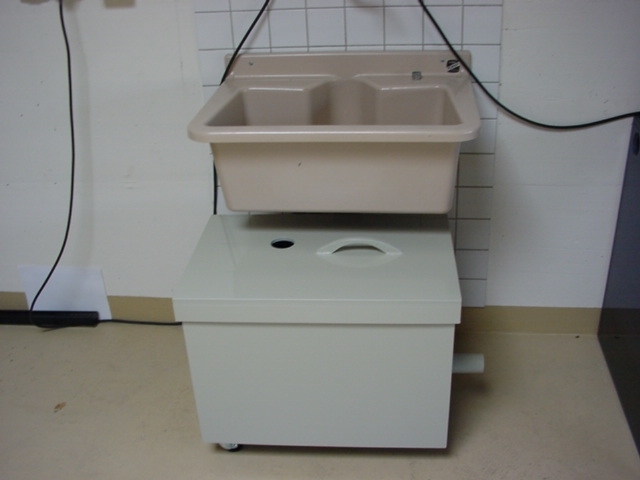 This flocculation treatment apparatus added to a CO2 treatment is economical, mobile and compact. 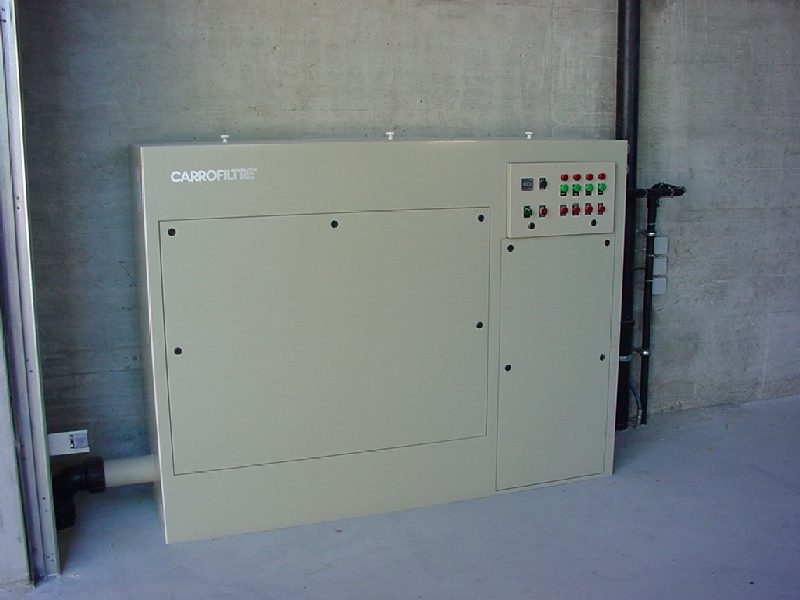 Carrofloc© meets the requirements of the ASPEE for discharge to wastewater or clean water and complies with the requirements of the DCPE 872. 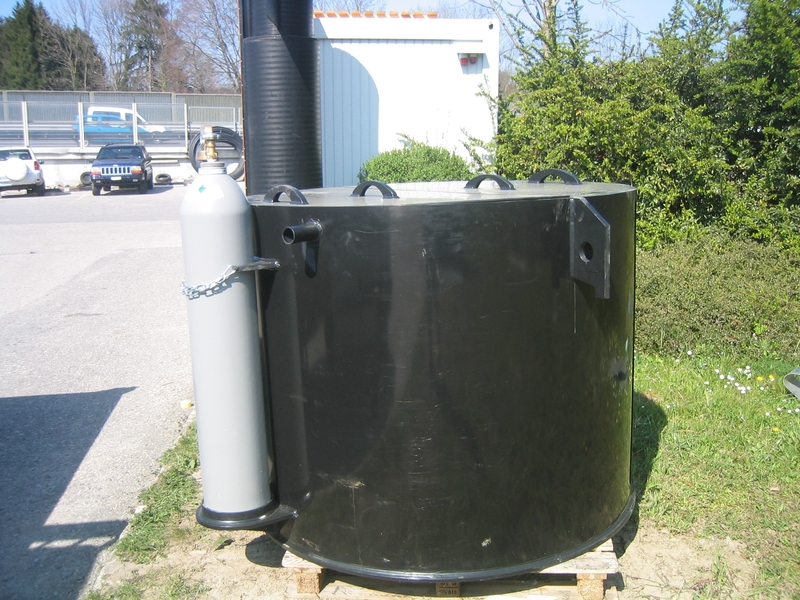 The Carrofloc© consists of an upper tank with a capacity of about 600 litres, an agitator, a drain valve, a filter bag and a discharge outlet. 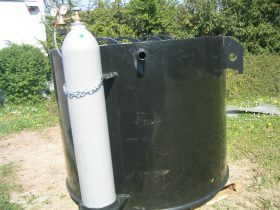 It is equipped with a complete CO2 kit including fixing for a 30 kg gas bottle, a regulator and a 6 mm hose. It is made entirely of high-density polyethylene which, despite its light weight, provides excellent resistance to corrosion and impact. Its simple operation requires a minimum of manpower. Treatment duration: approx. 15 min. 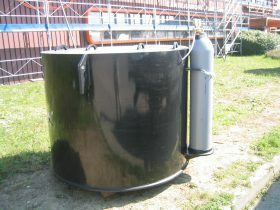 per 600 litre cycle. 4. 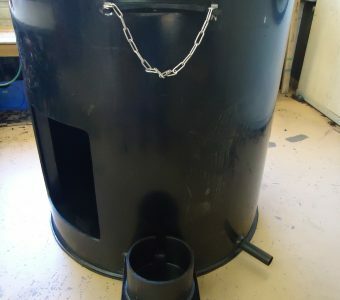 Once the desired pH has been reached (control with pH paper), open the drain valve located under the tank, allowing the water to pass through the filter bag. 6. Replace the bag as soon as it is full. 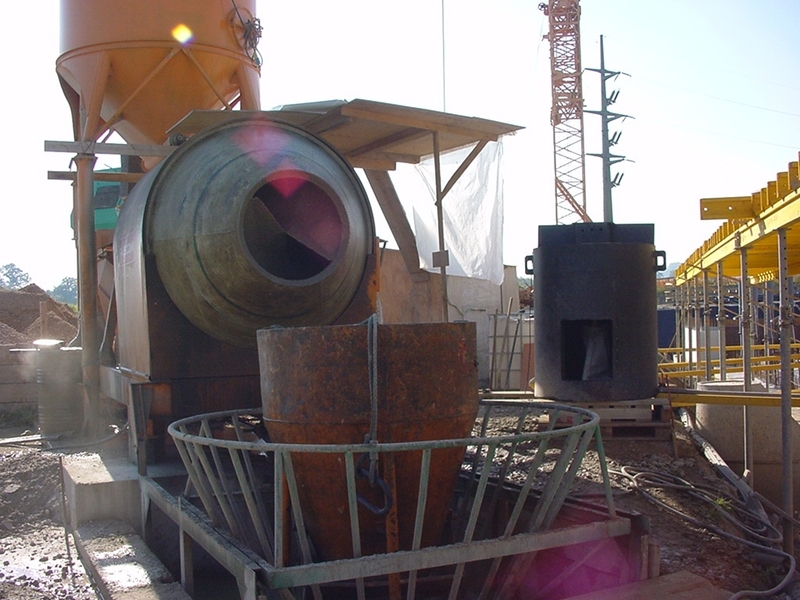 Since 1997, the SIA 431 standard requires the treatment of construction site wastewater. 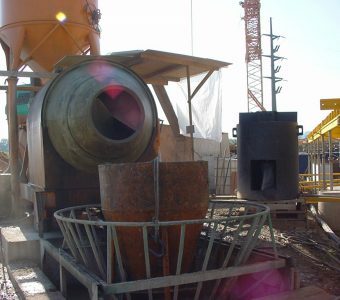 This includes concrete mixer wash water which, after primary settling, must be treated before it is discharged into wastewater or clean water plastic pipes. To meet these guidelines Canplast developed Carrogaz©. This treatment device regulates, via CO2 gas emission, the pH of the water to be treated. 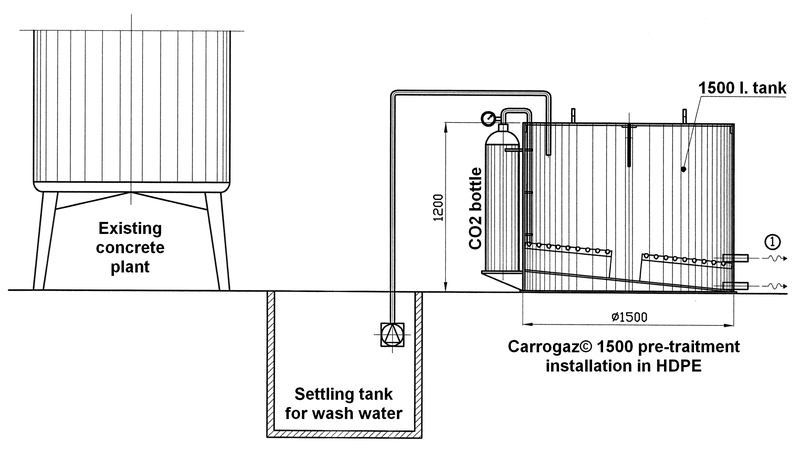 Carrogaz© meets the requirements of ASPEE in the case of discharge into wastewater or clean water. Carrogaz© has a treatment capacity of approx. 1'500 litres. 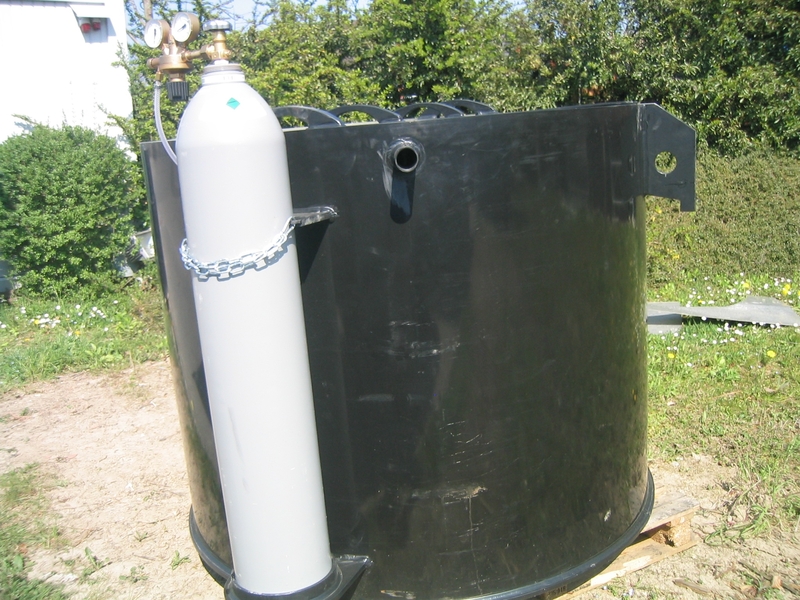 It is equipped with a complete CO2 kit including a fixing for a 40 kg gas bottle, a regulator, a 6mm hose, an outlet with a manual valve for the treated water and a lower outlet for the elimination of possible residues. 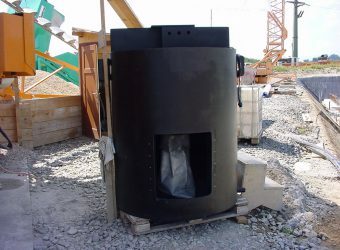 It is made entirely of high density polyethylene which, despite its light weight, provides excellent resistance to corrosion and impact. Its simple operation requires a minimum of manpower. Treatment duration : approx. 30 -40 min. 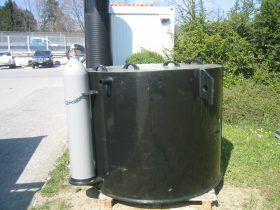 per 1'500 liter cycle. 2. Open the regulator of the gas bottle at 1.5 bar and let the CO2 act for approx. 30-40 minutes. 3. 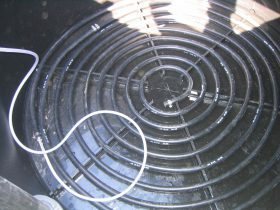 Once the desired pH has been reached (control with pH paper), open drain valve n°1 located at the bottom of the tank, allowing the water to flow by gravity infiltration or directly into the existing network.